Playing along with the music gives you more opportunities to "practice with the group" than you can get just in rehearsals. You will not be able to determine when to play the very first beat, so come in on the next measure. You can also slow down YouTube by clicking the gear and adjusting the percentage. You don't have the minute control of the speed, but it is better than nothing! Canyon - A classic American Orchestral piece; definitely find the original (orchestral version) and purchase & listen to it! This arrangement is themes from a few of the sections. 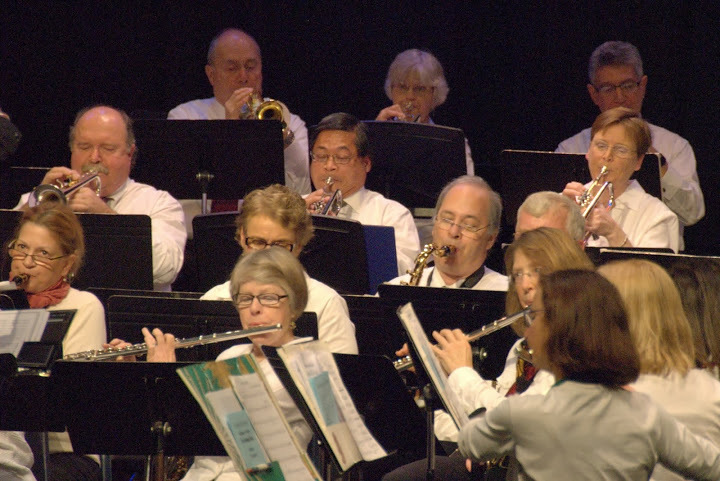 And here is a link to the YouTube performance of this arrangement by the Concord (Massachusetts) Band (a very fine band in the area!). https://www.youtube.com/watch?v=wRoLVbF_YuM It is fun to watch the timpanist and the other musicians playing. Swshsbuck - A great march! Fun to listen to and fun to play! Brush up on your syncopation and remember to keep the dotted eighth/sixteenths very jaunty! The two notes take up one beat and the sixteenth note is a very quick pickup to the next beat. Dragoon - The difficulty in this piece is your ear anticipating where the time changes are. The piece was written down by Percy Grainger (Irish Tune from County Derry) as he listened to someone sing it. Being a somewhat sad song, and the singer, singing alone with no accompaniment, took liberties with the rhythms, sometimes holding a note out extra long, sometimes shorter (remember how that worked in the version we did of Horkstow Grange, also collected by Grainger?). In order to get that feeling, this piece has changing time signatures. For now, just listen to the piece and try to get it into your soul. As you start playing it, keep listening a lot and soon you will hear those odd phrases. Rivers - A lovely piece where we will be adding our beginners to the band for their first "real" band piece! (WE MAY DO THIS PIECE THIS SPRING) CottonJoe - DEFINITELY put this in the SlowDowner to listen to and practice with! We will be doing it in 4 (at least for starters). Put on your dancin' shoes! Here it is at 3/4 of the tempo. KEEP THE FOLLOWING PIECES UNDER YOUR FINGERS FOR SENIOR LIVING GIGS, FEB & APRIL AND SUMMER. Troika - do NOT listen to the demo version -- the interepretation is way off from what we will do (ex: staccatos are too staccato). Here is the Israel Philharmonic Orchestra playing it. Use this orchestral original to get the idea of how the piece should flow. ApplachAM - Just gorgeous. Listen and imagine playing in the middle of this wonderful piece of music. Hey, and it is a quiet, lush, emotive piece, but nobody has died!! Whalemen - a fun pair of Irish tunes. Watch out for the dotted eighth/sixteenth and keep that sixteenth note crisp and tight to the following note. Exaggerate the dynamnics. ElRitmo - Fun, tune! Lots of great rhythmic happenings! ElRitmo solo background - This cut begins in measure 35. It then goes through 37-51, playing the repeat. HOWEVER, it is slightly confusing because the background horn parts are played in the first four measures, 37 & 40, then on the repeat, in the last four measures, 41-44! When you are playing along, you start right when the horns come in, after the one measure of drums (the strong drum hits, which are playing on 1, +of2, 4). Music for WINTER/SPRING to be posted soon. AshFarewl This OUR recording from Spring 2014. Nice. There were a few notes that got out of control and the last note had too much cresc on it. Also, the snare & bass got off and came in 2 meas late into 52 and then tried to play at 60, but they were watching and I could get them back on track by 68! I have done this piece MANY times, but this is definitely one of the best performances of it - passionate, peaceful... Bravo! BeachBoys: Fun, Fun, Fun!! This is not the demo recording (that was truncated), so there are some small error and some parts left out, and you can't really hear the woodwinds well most of the time. Beatles - follow the link for the demo. It is only a partial recording, though. Or you can play along with a YouTube performance at http://www.youtube.com/watch?v=CGN9DCfTngU. Not the best performance (it is a middle school, after all!) but it is decent and will give you a feel for the piece. Bogey - Here is a summer rehearsal from 2012 so you can play along. USN Band performance of the original - notice there is a part that we don't have in our arrangement. Barnum & Bailey's Favorite - a great circus march and a great arrangement! This is an external link, so you can not use it with the Amazing Slow Downer app. We will probably take it a bit faster than this. Greasy - this is a recording of my kids a few years ago - Some messiness and they don't get the subtleties (it was a, "we have 2 weeks before the concert - let's put this together...") But, you can play along and get a sense of the piece! It is an old piece and no longer in print and there are no YouTube renditions (there are some of the same title, but a different piece). Johnny - This is the recording from the Cape Concert. Also find the original by Chuck Berry to get a flavor of the piece in case you don't know it. Kentucky: (new soundfile - better interpretation & has all-important susp cymb)This is a classic piece; if you played in band as a youngster, you have probably played this one! Our goal is to play it better than you did as a kid!!! There is so much music in this arrangement of these Appalacian folk songs. As you listen, focus on listening to the harmonies as well as the melody. KindGentle - what a piece... wow. Here is the demo version. LibertyBellMarch - this is our version, played by my WMS band. I found it the other day - bones got a bit messed up, but otherwise a solid performance! LibBell-Pryor - this one is performed by the actual Sousa band - he wasn't conducting, Arthur Pryor was (his lead trumpet player). Sousa wanted nothing to do with recording on these wax cylinders; he predicted it would be the downfall of live music (he was right) and coined the term, "Canned Music". No repeats due to size constriction of the cylinders and no percussion because it was too loud for the technology! LibBell-Brion - this is the modern Sousa Band with director Keith Brion (Sousa scholar). Great rendition, complete with the Liberty Bell as Sousa wrote it! MilEscort: A great little march, actually by Henry Fillmore. Sousa once said, "I wish I had written that march!" PatrioticFest - nice arrangement and not very difficult. We will have the audience sing along. Here is an excellent performance of the arrangement for band done by Leroy Anderson himself. It is different from our arrangement in a couple different ways: it has the trumpet fanfare at the beginning and end, it has triplets in places where our arrangement does not, it has an extra middle section that also includes the trumpet fanfare. . . AND — it is in a different key (a minor third higher than ours). So, listen to it to understand how the trumpet fanfare works at the beginning and just to enjoy it but don’t try to follow your music or play with it. RowanTree - This is such a gorgeous Scottish tune. Follow this link to see the lyrics. Yankee / Chester - our July 4, 2012 rehearsal recording so that you can hear the repeated section. This link goes to the demo version.